Cheers to a GREAT day of bottling…I can still hear Dave Gifford’s bottling cheer in my head – “I love bottling yes I do, I love bottling how about you…?” Thanks, Dave!! After 7 hours of bottling my Passaggio Wines 2012 white wines and the ensuing clean-up, it was time to open the Mer Soleil Silver 2011 Unoaked Chardonnay. I have waited to open this bottle all week. 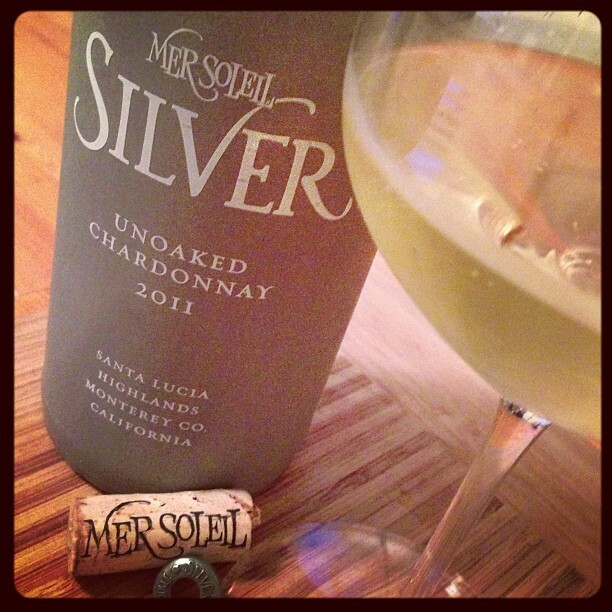 I actually purchased four bottles of the Mer Soleil Unoaked Chardonnay on WTSO for $20.99/bottle. 14.5% alcohol by volume. The bottle is a great ceramic piece but quite heavy. (You could hurt someone with it – LOL) A great concept though, since they ferment and age this wine in stainless and concrete tanks. The wine had a wonderful nose. A lovely gold color with layers of tropical fruits, slight yeasty aroma, with a hint of minerality, citrus, and green apple made me want to keep swirling and sniffing this wine in the glass. On the palate – a nice medium mouthfeel (a little heavier than most unoaked Chardonnay) I found layers of lemon zest, peach, pear, grapefruit, and a nice acidity that makes this a great food friendly wine.